Weather forecast and reanalysis models exhibit different performance in daily rainfall estimation over the Ethiopian highlands, 2000–2012, with ECMWF closer to observations than other models. Background is given to illustrate the Hadley circulation and easterly jets over Ethiopia, using sections on 37°E in July–August 2011. ECMWF reanalysis has a narrow band of rainfall >15 mm/day on 10°N, consistent with TRMM satellite estimates, associated with a steep gradient in meridional wind. MERRA and GFS models have a wider band of rainfall and weaker gradients in meridional winds. The contrasting background states influence a nested WRF model simulation of heavy rain in the upper Nile Valley on 29 July, 2011. The GFS (ECMWF) initialization yields stronger northerly (southerly) winds north (south) of Ethiopia, while aircraft observations are southerly at 850 mb and northerly at 700 mb. ECMWF produces heavy and widespread rainfall consistent with observations, with a potentially more realistic simulation of the Hadley circulation. 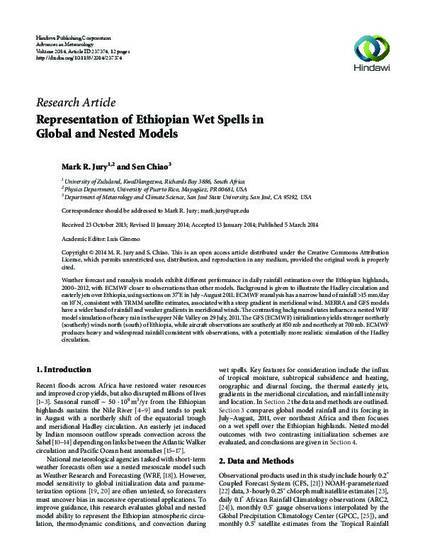 This article was published in Advances in Meteorology, volume 2014, and can also be found online at this link. Copyright © 2014 Mark R. Jury and Sen Chiao. This is an open access article distributed under the Creative Commons Attribution License, which permits unrestricted use, distribution, and reproduction in any medium, provided the original work is properly cited.